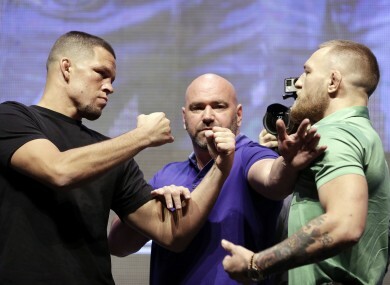 UFC 202 takes place on 20 August. The event promises to be one of the biggest in UFC history. IRISH MMA FANS hoping to watch Conor McGregor take on Nate Diaz later this month on UFC Fight Pass, may have to make alternative arrangements. The UFC has revealed that it will no longer broadcast live coverage of any main card event on the platform with immediate effect, although fights will be shown 48 hours after the event is finished. The news will be a further blow to fans of the sport in Ireland who subscribe to Virgin Media, as the only place to watch main card events will be on BT Sport, which is only available on the eir Sport pack in Ireland. Last month it was announced that Virgin was to remove all BT Sport and eir Sport channels from their platform, after the two parties failed to agree commercial terms following eir’s takeover of Setanta Sports, and as it stands, the channels remain off the Virgin Media service. The UFC has also just renewed its deal with BT Sport, meaning UFC events will remain exclusive to the channel until the end of 2018. Although featured and preliminary bouts will remain live on the Fight Pass, the news will be bad news to fans in Ireland hoping to watch UFC 202 on the online streaming service. Email “Further bad news for Virgin Media subscribers who plan to watch Conor McGregor's rematch against Nate Diaz”. Feedback on “Further bad news for Virgin Media subscribers who plan to watch Conor McGregor's rematch against Nate Diaz”.